New to 2019, the Brompton bike cover is a 2 in 1. Instead of 2 separate items, you now have the bike cover with an integrated pouch. Often useful, especially on public transport, the zip-up Brompton Cover is quick to fit and remove with an elasticated hem for a secure fit around the bottom of the bike. 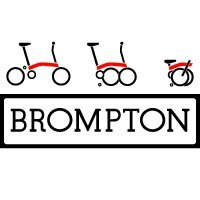 It fits nicely on all Brompton bikes, including Brompton Electric. New woven label on the outside of the folded pocket. Moulded Velcro at the back. Pointed webbing end for easy insertion through the saddle loop. Reinforced protection at handle bar hinge stress point. Reversed pocket acts as the padded protection for folding pedal. Luggage loop for attaching identification or luggage tag. Two-way zip to allow access to saddle from the top of the cover. Elasticated hem creates a secure fit around the bottom of the bike. Woven Brompton tab at the end of zip which doubles as a pull tab. The cover is shaped so it fits without slack. Suggestion: if you open the cover from the zip puller on the top and adjust the cover, the saddle can be used as a grab handle for rolling the bike. Material: 140D Ripstop nylon with water resistant PU coating. Weight (approx. ): Weight (approx. ): 215g.